If the last 15% would’ve never happened, I probably would’ve given this book like three stars. I’m not sure what’s wrong with the characters, I liked Frances—it really showed how she’d changed and that she wasn’t really “innocent” anymore, but then there were some things that really put me off. Also, sometimes, it showed that becoming Libby seemed way too convenient for Frances. I wasn’t sure how I wanted things to turn out, but I do know that I would’ve loved for Cecil for at least to actually be there. He was the one who came up with the actual idea of Frances becoming Libby in the first place! I was kind of upset when they show a couple of chapters later that Cecil wasn’t alive. I guess the purpose of his death was to fuel Frances’ need for revenge? Like: Frances is always mentioning how “polished” she is as Libby and she explains how she’s planned everything so precisely over four years, but then she’ll do something like let her emotions get in the way. And, I thought that a lot of things could’ve gone a little faster and better had Frances had tried to plan more and actually communicate with some people. Okay, well, WHY ARE YOU LETTING YOUR FEELINGS GET IN THE WAY OF THIS “cold, deliberate action”?! the people that attacked the Persephone just assumed it was okay to kill a cruiser of three hundred and more people instead of just killing the fourteen people and then buying out the Senator. Like, did the organization think that they should kill the people supporting this campaign on a ship? Why not later? Why not before? The deal would have collapsed nonetheless . . . So pointless. It wasn’t even personal. I didn’t get it. The only character I actually liked and had absolutely no problems with was Shepherd. But, of course, as our main protagonist, Frances—aka Libby—was pretty filled up with her own good moments, too. I thought Grey was okay, but I wasn’t the biggest fan of him. I didn’t really care about Grey’s feelings. I know that sounds insensitive! But, I didn’t get him! 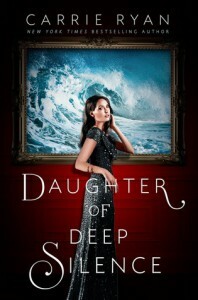 Overall, Daughter of Deep Silence is an interesting read. I think the theme is how you perceive the story as a whole. For me, the real turning point on the story was when the last 15% happened. But besides that, at a certain point of the story, I thought it dragged out. I liked Frances as a character, and I did like some side characters. But the overall reveal and the some other characters, not so much.